I wonder if the deity you mentioned that's frog headed and living in the primordial chaos was the inspiration for Slaad from the plane of limbo or chaos in D&D terms. Were they from another dimension as well or is just association by Froggyness? Course World of Warcraft as an MMO was inspired by Everquests success, wow is connected through Kek, and both have created chaos in the world, even enslaving people with online addiction. Evercrack and Wowaholics ring any bells? Some examples of the chaos created in the world by video game addiction, something both WoW and Evercrack topped the charts in. Sure, plenty of bells. The Frogloks were enemies that became playable characters. I have to also note the murloks of WOW. I'm with you in Old School D&D as well ... red, blue, green slaadi, death slaad, etc. Does any of that have to do with Pepe, per se? Who can say? ON another tangent. I'm going to be out of my water really quickly in Egyptology ... I'd be the first to admit. The Frogs is a comic play by Aristophanes. The choir of frogs sings the famous onomatopoeic line: "Brekekekex koax koax. D&D is considered akin to devil worship by some Christian groups, who've posted several odd comics on the issue. 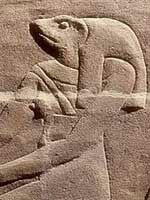 Frogs according to your link was in medieval Europe one of the symbols of the devil. Speaking of D&D, it's recently played a big part in a new show called Strangers Things that also involved another dimension and a weird amphibian like monster antagonist. D&D is considered akin to devil worship by some Christian groups, who've posted several odd comics on the issue. Yep ... Demogorgon was the ruler of the Abyss (666 layers of Chaotic Evil alignment) in oldschool D&D. I haven't gotten to watch Stranger Things yet ... have you? Okay. I'm splattering references now. Time for a break. Again, sorry if this has distracted from intent of OP. I do appreciate everyone that has stayed on topic for this one. I was much more intrigued by the idea of some internet meme resurrecting an ancient diety, power of the human mind, etc..
Maybe I should have put this topic in a different forum? either way... The hieroglyphs that looked like a person at a computer made me laugh and then immediately question reality for a minute. The power of collective thought is very interesting subject and the Internet is an enormous pool of thoughts/intentions.